Quote Reply Topic: MYTT Match That Almost Happened! Nearly 10-years ago, during the height of the frictionless pip ban controversy, I half-seriously challenged the president of the ITTF to a friendly good-will match in protest of the ITTF ban. 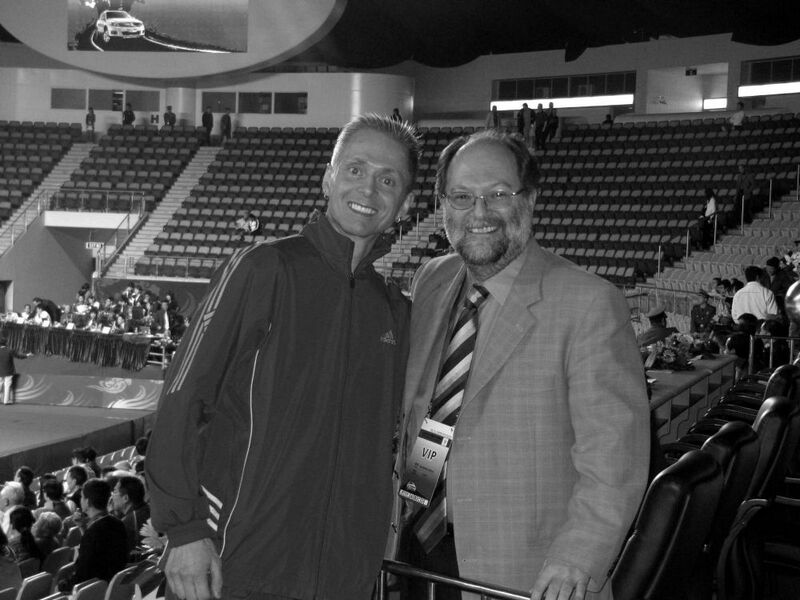 To my surprise, Adham Sharara accepted, and one year later we met at the Volkswagen Open in Guangzhou, China. Hookshot accompanied me with his lovely fiancé. I was outfitted with Dr. Neubauer gear featuring his Special blade and a pair of super slick "Illegal" pips. Unfortunately, the match never happened . . . it was simply too chaotic due to the pros pre-game warm-ups and the special event stuff . . . no fault of any party. I realize Adham has become a bit of a villain since that time (I guess he was bad to the bone back then too or I wouldn't have challenged him). I'm not defending what he did or didn't do wrong over the years; yet, I have to admit . . . he was a good host and gentlemen in person. All that's left is this photo. I created this thread because over the years several members have asked me, "Hey, what happened with that challenge?" what??? ITTF president couldn't arrange for a table? I would bet Trump would have been able to arrange for some event similar (not necessary in TT) if you guys were to get together.